I am a stamp-carving, pattern-making, color loving, Africa-dreaming Imperfectionist. 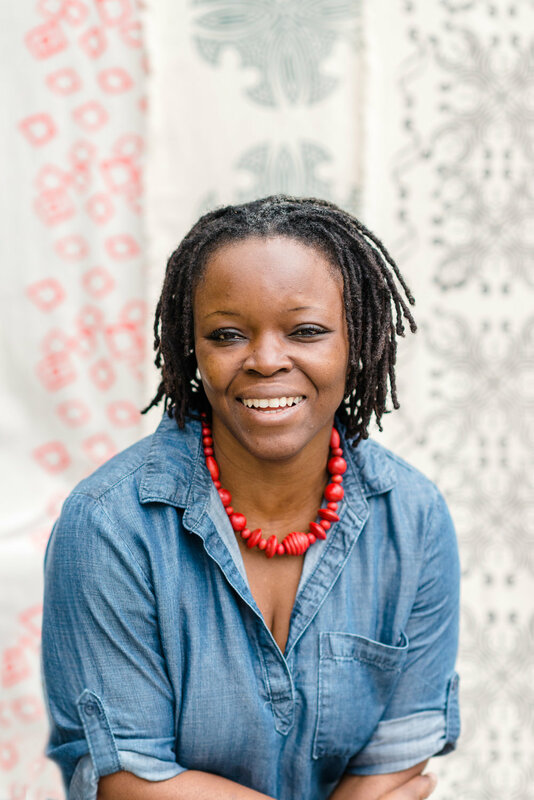 Otherwise known as a Nigerian-born, America-raised Textile Artist and Surface Designer. I’m also a Wife and Mom of 3. I came to America when I was 13 in the mid-80s and have been here ever since. I have always been a creative person, always making something. I also have a passion for Interior Decor. Having been uprooted from my home country, I have always been exploring the concept of ‘home’. I believe that ‘home’ should be a soft place to land, and a comfortable and joyous place to be. I stumbled into Textile and Surface Design when I took a printmaking class in college. I realized the satisfaction of creating a motif and having it immediately turn into a tangible piece of fabric. I naturally gravitate towards African/African-inspired looks. As someone who really loves color, I love to drench my designs in bold color. I believe in inspiring joy with my design work. Beyond fabric, I am currently exploring 3-dimensional applications of my motifs. I started doing what I do because I wanted to see something different from the usual prints and patterns I see in home decor. I love the geometric, imperfect shapes of African prints. As yet, this aesthetic seems to be enjoying some popularity, and the vision is being realized, but I think there is still room for more. I aim to bring a fresh perspective to this market with my work. I am also branching into sharing the knowledge that I have amassed through all my research. I believe knowledge should be shared so that it can be expanded upon. I share block-printing and textile design tips and techniques on Instagram, my blog, newsletter, and soon, ebooks. I have a somewhat complicated relationship with Black History Month. As an African who does not share the exact cultural history as Black Americans, I sometimes feel like I am performing blackness. I exist in this space and have the same societal realities, therefore I appreciate, respect and understand the need for Black History Month. Also, my children are Black, and will not/do not have my perspective. Black American history is relevant, and important to me because without the work put in by Black American ancestors and forbears, I would not enjoy the freedoms I enjoy today. This year, and every year, I reflect on the bravery that it took to overcome all that they did. I try to honor that history and legacy by striving for excellence for myself, and demand it for my family, year round. To be honest, and not to be corny, I am constantly inspired by my children. I have a soon to be 17 year-old daughter, and 14- and 11-year old sons. I admire in them all the things I see as shortcomings in myself. My daughter is highly intelligent, thoughtful, stylish and graceful. My middle son is an amazing Artist. He decided when he was about 10 or so that Art was his calling, and he is single-mindedly focused in his pursuit of bettering himself. My youngest son is so sweet and innocent. They inspire me to keep pursuing my dreams, because by showing them what is possible, it will never occur to them to think that there is a limit to what they can achieve. I am also inspired by my late mother. She died when I was 9 years old, so I never knew her as an adult. In a way I have lionized her, but I remember her as being the epitome of style, grace, and class. I try to live up to that. Creatively, I am so inspired by all the creativity I see on the ‘Gram, especially Black creatives. We are not afraid of color! I am constantly amazed by human creativity. I think I have finally reached a place where I can be inspired without comparing myself. It wasn’t easy, but I have learned to follow my own path, no matter what others are doing. I am super inspired by all the Nigerians doing it big in the realms of entertainment, art and design. Nigerians are enjoying a popularity right now. Instagram has even released a filter called ‘Lagos’! This is big! I love this because when I was growing up, the Arts were not seen as a viable career path, at least not in my socio-economic background. We were only allowed to be doctors, lawyers, engineers, full stop. I love that we are bringing our culture and language along and putting it on center stage, dispelling stereotypes.